President Obama met Thursday with leaders of the NAACP, the National Black Justice Coalition, the Leadership Conference on Civil and Human Rights, and other prominent social justice groups largely focused on the needs of African-Americans. At times during Mr. Obama’s first term, such a meeting would have drawn notoriety amid charges — from people such as PBS talk show host Tavis Smiley and social activist Cornel West — that the president was reluctant to push policies specifically aimed at helping the poor, especially low-income African-Americans. White House director of African-American media Kevin Lewis was in the thick of answering such charges like those back in President Obama’s first term. In an interview with the NewsHour, Lewis explained why the president’s policies helped everyone. “In the first term we did a good job of trying to get the policy right, to fight Congress to keep student loan [rates] low, preserve unemployment benefits, the earned income tax credit. Those are huge to the African-American community,” said Lewis, who has been with Mr. Obama since the 2008 campaign. “[Just because] you don’t put ‘black agenda’ or African-American in front of a policy doesn’t mean it doesn’t absolutely help African-Americans,” said Lewis. In his State of the Union address, the president highlighted plans for a slate of programs to help low-income neighborhoods, including pre-school for all children and start-up loans for businesses. “African-Americans are disproportionately [helped] by universal pre-kindergarten, incentives for companies to invest in low-income neighborhoods, incentives for job training,” Lewis said. According to Lewis, during earlier meetings with the president, the groups represented in Thursday’s meeting suggested some of the ideas the president put forth in his speech. “[The president saw the latest meeting] as a chance to drill down on messages and issues from the State of the Union [about helping] the hardest hit neighborhoods,” he said. 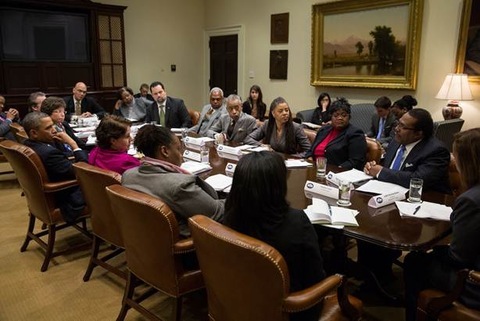 Mr. Obama also granted interviews Thursday to black radio hosts and to local TV news anchors in carefully selected markets to make the case for his solution to the pending across-the-board budget cuts known as the sequester. Such cherry-picking among media outlets this week chafed already irritated members of the White House press corps, who accused the president of going around them the same way he goes around Congress to push his point of view directly to constituents. Lewis, who began his White House stint in the press office, says both decisions reflect a strategy required by the times. “We’re looking to make sure we use all the methods. [Being on] black radio is part of that. It helps to hear him on different platforms,” Lewis said. The White House plans more African-American oriented initiatives and events, including the president’s speech next week at Wednesday’s unveiling of a statue of civil rights figure Rosa Parks at the Capitol. Follow the politics team on Twitter: @cbellantoni, @burlij, @elizsummers, @kpolantz, @indiefilmfan, @tiffanymullon, @dePeystah and @meenaganesan.